81 Government Junior Colleges in the State. Out of which 68 Government Junior Colleges were started from 2007 onwards up to 2014-15 and 1 Junior College in 2015-16 and 2 Junior Colleges in 2016-17 and ten Junior Colleges prior to 2007. In the reference 3rd read above, the Higher Education (IE) Department has proposed for the creation of 1133 (One Thousand, One Hundred and Thirty Three) Teaching and Non-Teaching posts (Principals-43, Junior Lecturer-781, Physical Director-78, Librarian-78, Senior Assistant-77, Junior Assistant-76) in 79 Government Junior Colleges in the State. 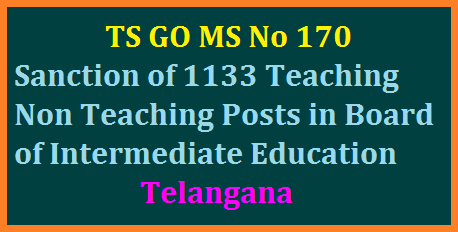 Government after careful examination of the proposal, hereby accord sanction for creation of (1133) Teaching and Non-Teaching posts for 79 Government Junior Colleges in the State under the control of Commissioner of Intermediate Education, Telangana State, Hyderabad, as shown in the Annexure appended to this order. The Higher Education (IE) Department / Commissioner of Intermediate Education, Telangana State, Hyderabad, shall take necessary further action in the matter accordingly.